Snoring is a common occurrence in children and can be caused due to multiple factors. It can be mild or serious. Read to learn how to help. The comfort and health of children are top priority for all parents. Hence, when it comes to the sleeping habits and snoring of your child, it is normal to have certain questions in mind. Is snoring a normal occurrence in children? Will it cause any harm to them? When does snoring in children raise concern? What measures you can take to prevent snoring in your child? Read the article to get the answers. Disorders of sleep are considered serious or high-risk causes of snoring in children. Generally, air passages get blocked due to these disorders leading to vibrations, which are heard as snoring. Apart from disorders of sleep, infections may also lead to snoring. Treatment of an infection may be done faster in comparison to a sleep disorder; however, it may still endanger a child’s life. Obstructive Sleep Apnea: It is a serious disorder of sleep, which requires medical intervention soon after its diagnosis. Children who suffer from OSA have chronic airflow obstruction resulting in difficulty in breathing. Approximately 3% of all children falling in the age group of 0 to nine years have OSA. The obstruction is either partial or complete (temporarily). Partial implies difficulty in breathing, whereas complete implies temporary stopping of breathing for a couple of seconds. Both kinds of obstruction are dangerous and cause snoring in children. Respiratory Infection: It can range from minor infections such as mild allergies, sinus infection or common cold to life threatening infections such as pneumonia, severe attack of allergies or bronchial infection. You can’t specify the type of infection without medical tests; hence, you should observe the signs and symptoms of your child carefully. 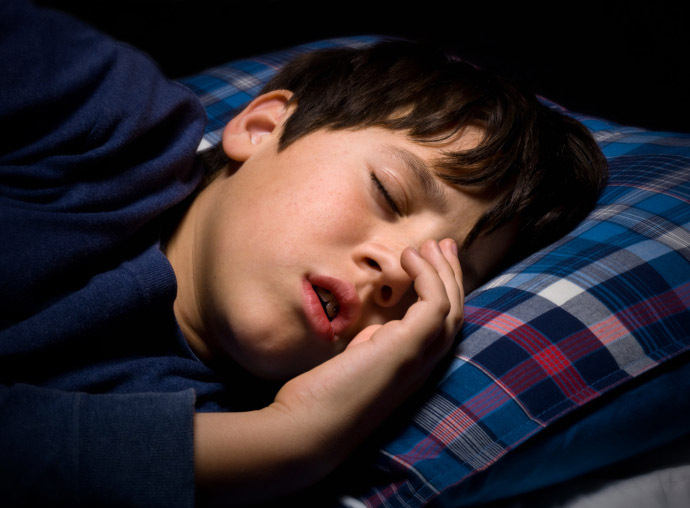 Snoring in children may be due to throat problem or nasal blockage. It may be minor at first; however, similar to any other infection, it may get better in a couple of days or worsen. Enlarged Tonsils and Adenoids: This is among the most common causes of snoring in the children. These glands may swell either due to physical damage or infection, blocking the air passage temporarily. This makes breathing during sleep difficult for the child. You may take this as not a serious cause of snoring, but this may lead to the development of OSA. Enlarged tonsils and adenoids can be easily managed and treated during early stage; however, at an advanced stage, surgery may be required. These causes can also improve with proper medical intervention. But they are less dangerous in comparison to the three causes described above. Deviated Nasal Septum: In this condition, one of the two nostrils is either slightly deformed or damaged. As normal inhalation is not possible from the damaged nostril, breathing becomes difficult. There is nothing much to worry about this condition as the problem exists only in the nose. The condition causes more problems in babies up to the age of 2 years. Nasal Polyps: This condition is common in the children of age group 10 to 14 years. There are no noticeable symptoms present apart from snoring in children. Majority of the children reach adulthood without getting permanent treatment to the problem such as surgery. Weak Muscles of Throat and Tongue: When the muscles of throat and tongue become relaxed, they collapse inside the air passages and block them. This makes breathing normally almost impossible. This is considered worrisome but normal. Seasonal Allergy: Some children have allergy to pollen that makes their nose stuffy. A stuffy nose filled and blocked with mucus, makes breathing difficult and results in snoring. Being Obese and Overweight: Being overweight leads to narrowing of the air passages of the nose and this may be the reason of snoring in your obese child. Asthma: Children with asthma have inflammation of the air passages, which leads to difficulty in breathing while sleeping resulting in snoring. Your child may require treatment if they show other symptoms such as sleepiness during day, bed wetting and bad performance at school etc. apart from snoring. It is imperative to find the cause of snoring. Once your physician determines the cause, they will suggest appropriate solution for the problem. Vaporizer: You can use a cool-mist vaporizer to help relieve night time symptoms of stuffy nose and snoring. Sleep Position: Modify your child’s sleep position to stop snoring. Try rolling them gently to their side to stop snoring. You can also lift their shoulders and head to help relieve nasal congestion by placing pillow under their head and shoulders. Air Purifier: If your child has developed allergy due to dust, use an air purifier in their room and shut the door to their room. Keep the Nose of Your Child Clear: A nasal wash and decongestants may help keep the nose of your child clear. It helps in unblocking the mucus, which may cause snoring in children. You can discuss with your physician about various OTC remedies that are appropriate for your child. Surgery: If the cause of snoring in your child is enlarged tonsils or adenoids, you can consider surgical removal of these glands. Surgery is also recommended if there is any structural problem with the face, jaw or throat of your child. Orthodontics: If the physician finds that there is a structural problem in the jaw, they may initially recommend using an orthodontic. Your child may be required wearing a customized mouthpiece during sleep. Positive Airway Pressure: Often CPAP or Continuous Positive Airway Pressure is required to treat sleep apnea in children. CPAP requires your child to wear a nasal or facial mask while sleep. The mask is connected to a pump that gives positive airflow in nasal passages and keeps the airways open. Diet Changes and Exercise: If your child is obese or overweight, the physician suggests dietary changes or exercises to reduce their weight. The exercises are suggested to make the muscles of the neck and throat strong. The strengthened muscles of the throat help in the treatment of sleep apnea worsened by your child’s obesity. A chart of height and weight for kids can help you track your child's growth and development. In general, girls will have a lower weight level than boys. Know more! Best Balanced Diet Samples for All Children! Should You Wake Your Baby Up to Breastfeed?